​”Just finished the Cowboy Tough 3 1/2 day adventure race in Wyoming for my last two full centuries. We paddled 100 miles, biked 240 miles and trekked 30+ miles. 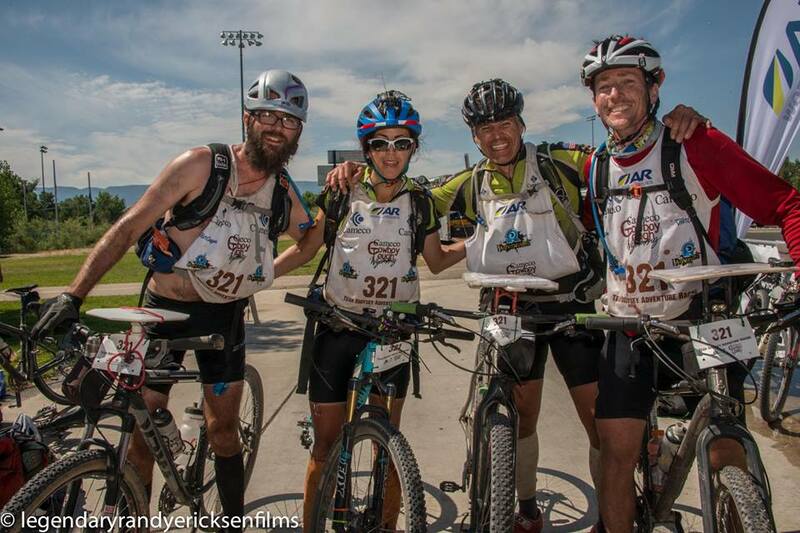 The race started with a 30 mile paved bike with a neutral rollout out of Casper, followed by a 75 mile paddle on the North Platte and Glendo Reservoir. 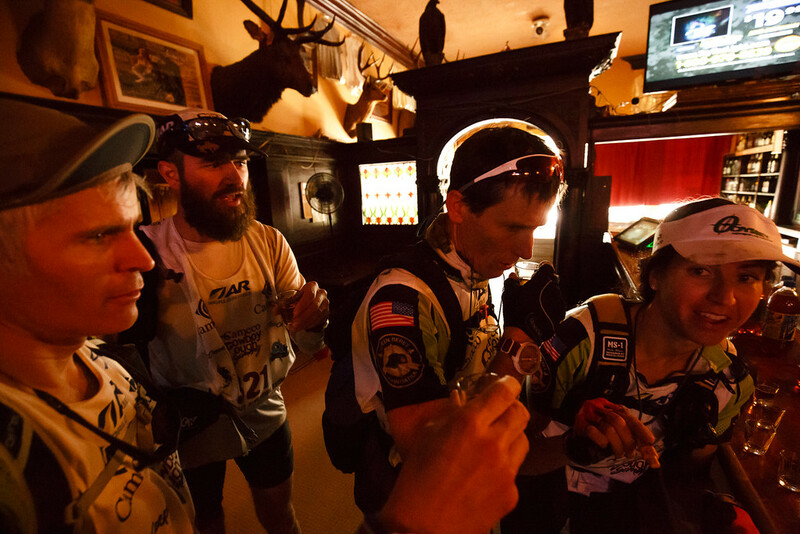 Sprinkled into the paddle were 3 short trekking sections, one of which was in the town of Douglas and included a stop at a cowboy bar for a shot of Wyoming Whiskey, one of the race sponsors. We arrived at Glendo State Park in the middle of the night, and had to tackle 30 miles of of the IMBA Epic trail system there. Nothing like riding unknown, rocky, semi techinical trails in the dark with plenty of exposure. The fatigue, darkness, and knowing we had over 2 days of racing left turned some probably ridable sections into hike a bike, but better safe than sorry. By the time the ride ended, we were enjoying sunrise and the start of day 2. Day 2 started with a canoe portage to the Platte River below the dam and another 25 mile paddle down river to Guernsey Reservoir. From there, we hopped on our bikes again for a short ride on the gravel roads in Guernsey State Park followed by a short stretch of Highway 26 and then more gravel to a Boy Scout Camp. From there it was a 15 mile trek overnight along a trail that was much better marked on our maps than it was in real life. We tried to follow the trail for awhile, but eventually just decided it was faster to bushwhack along the creek it followed. A slight navigation error along with the fact that we had only slept about a half hour to this point cost us some time, but we eventually made our way to the next transition area by morning. Day 3 came and we were behind our time estimates and had to start making decisions. We went down for our first real sleep other than a couple naps along the way and got 90 minutes of much needed sleep. The race staff imposed a time cutoff and we weren’t allowed to climb Mount Laramie, which was a bummer, but probably the right decision anyway, so we got one close by checkpoint, and it was back on our bikes for a lot of gravel and a lot of headwind. We biked 35 miles to the next trekking section which also included a rope ascent and rappel, which was pretty cool. A couple checkpoints had us scrambling down a very rocky reentrant. Back to the transition area and on the bikes again… This time 45 miles to the next foot orienteering course. We were tired, it was windy, and hot at first. Then Mark had a flat tire, then it got dark, then we got cold, then a thunder and lightning storm kicked up right in front of us. We were having the worst leg of our race and we decided with the lightning to hunker down for awhile and try to sleep. The four of us wedged ourselves under rock overhang and tried to sleep. I think I did, but sounded like noone else really got much rest. We were there for over an hour and were losing even more time to the course. After some race staff saw one of our blinky lights in the ditch, they checked on us and woke us up, so we decided to just get up and start moving again. We made it to the next TA, but by now we knew we were pushing our luck with even finishing the race on time if we tried to get any of the optional trekking points, so we took a short break, ate some food, and soldiered on. Another 40+ miles to the next TA on top of Muddy Mountain. The first 25 miles of this section were great. We finally got a tailwind and it was relatively flat. But the last 15 were tough, included 1000′ of climbing in the last 4.4 miles up the mountain. I was shelled by the time we reached the top, but we were still concerned about finishing on time. We still had to go down Muddy Mountain, climb up the backside of Casper Mountain and then descend into town to the finish. We quickly refueled out of our bins, dropped everything but our mandatory gear and a couple water bottles and headed out. The 1000′ descent was fast and sketchy, but the climb up Casper mountain was tough, although it ended up being a little easier than we thought. At the top of the mountain, the road turned to pavement and we were able to coast down the switchbacked road all the way into town. My speedometer hit 45 miles per hour, which felt like light speed after 230 miles.